Sandwich With a Side of Romance by Krista Phillips is an entertaining and relaxing read with realistic characters and a satisfying Christian theme without being supercilious. Madison “Maddie” Buckner is a twenty-year-old hairdresser who’s just earned her cosmetology license and moved to Sandwich, Illinois to work in a hair salon and begin a new life. So how in the world did she wind up working in the Sandwich Emporium? Her heart’s desire is to be able to provide a home for her eleven-year-old brother—and to avoid a romantic relationship at all cost. As a new Christian, her past niggles at her, threatening her new-found faith. Reuben Callihan owns and manages the family business with plans for expansion. His abrupt and overbearing personality is a challenge Maddie willing to accept to keep her job. Although deep down a caring person, he struggles with the loss of his father and the man who he feels is trying to take his place, the stresses of running a business and a relationship he’s not sure he wants to be in. Olivia “Livy” Sanderson is Reuben’s drop-dead gorgeous girlfriend with whom he’s been involved off and on since high school. She’s also jealous, smothering, and manipulative. Allie Crum, became Maddie’s best friend who sometimes pushes Maddie outside her comfort zone. Betty and Gary Luther, Reuben’s mother and step-father, “bless the socks off” Maddie with their generosity, while giving Maddie a taste of a real, loving family life. Kyle Buckner is Maddie’s street-wise younger brother who’s stuck in the system with a foster mom he calls “Sarg” and her husband. The Blakelys have applied to adopt Kyle. Will Maddie be able to qualify before the adoption goes to court? Debut Krista Phillips has created a winner in her first book, ”Sandwich,” and I, for one, am looking forward to more of her work. Krista writes inspirational romantic comedy. She believes a sprinkle of laughter (and a wee bit of chocolate) makes everything a little better! 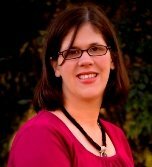 She blogs regularly about life as a wife, mother, follower of Jesus, and mother of a child with a rare congenital heart defect at www.kristaphillips.com She lives with her husband and four beautiful daughters in middle Tennessee. She also contributes to the blog, The Writer’s Alley at thewritersalley@blogspot.com. Sandwich With a Side of Romance, published Abingdon Press, is available in paperback or eBook at http://www.Amazon.com, http://www.Christianbook.com, and http://www.booksamillion.com, or ask for it at your local bookstore. This entry was posted on Monday, September 10th, 2012 at 11:08 PM and is filed under BOOK REVIEWS. You can follow any responses to this entry through the RSS 2.0 feed. You can leave a response, or trackback from your own site.